Coming Soon! Luxury Apartments, Lewes! David Beaken, Director, commented “The Old Brewery offers 12 Luxury apartments which are positioned in the centre of Lewes. There are 10 two bedroom apartments, which all have 1 parking space and 2 one bedroom apartments. Apartments with parking in Lewes are extremely rare so it’s great for us to be able to offer these options to our clients”. The Old Brewery is positioned off Daveys lane which is within walking distance to all that Lewes has to offer, from Lewes Train Station, Cafes, Restaurants to The River Ouse. David Beaken continued “All of the apartments are positioned from the first floor up. Each are quite unique in their views, kitchen styles and bathrooms. The light levels and space are lovely and with the apartments being positioned over 3 floors the views change from apartment to apartment”. The 12 apartments are positioned within 2 buildings. 9 of the apartments are converted from the Old Brewery building but within the grounds is a new building which houses 3 of the apartments. Whether you are looking for a new build or a conversion this development offers you both. Positioned on the third floor of The Old Brewery is an amazing Penthouse style apartment. 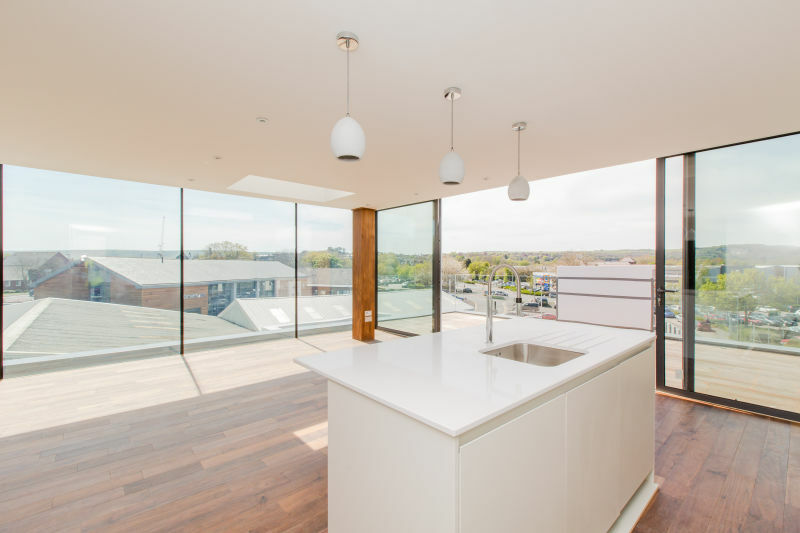 This truly stunning and unique apartment has floor to ceiling glass which offer the most amazing panoramic views around Lewes town centre and beyond. David Beaken continued “This top floor apartment has its own private roof terrace and there is nothing to compare it to in Lewes, in fact the terrace is one of the largest I have seen! It boasts an open plan kitchen and living space which when the doors are open onto the roof terrace is the most amazing space to entertain and watch the sun from morning, noon to night. There are 2 double bedrooms, the master having the added luxury of an ensuite and dressing area. It really must be viewed to fully appreciate the views and space this apartment has to offer”. Prices start from £275,000 and Oakley Property will be launching these apartments on Saturday 21st May from 10am to 3pm and Sunday 22nd May 11am to 2pm. Please call David Beaken on 01273 487444 or email david@oakleyproperty.com to book a convenient time to view these apartments on the open weekend or for more information on these luxurious apartments.